Hard water is a common problem for residents that live in Phoenix. Read up on our 8 issues related to hard water by click here. RO system filters dissolved metals, harmful bacteria, and other inorganic contaminants from the water to give you pure, clean, contaminant free water. Have one installed in your home today! Get Your FREE Quote Today, Click Here! Take your brand and marketing to the next level.  Custom labeled water is the best way to leave a lasting impression on your customers. Alkaline water has the ability to hydrate your body, balance your pH, and provide essential minerals that make a real difference in health. A unique way to promote your business, event or to just make a special occasion more ‘special’. Looking to promote your upcoming event or business? Had enough of the taste from water coming out of your faucet? Are you looking to have more than just filtered water? White Water LLC is a family owned business. We were established in 2002 and have the ability to provide custom label water nationwide, 3 and 5 gallon home and office delivery, and point of use cooler systems. We love white water! They are the best and very affordable ! I recommend them to everyone! So easy and convenient. Best prices I have found and great tasting H2O! Many people ignore the branding opportunities of private label or custom label bottled water because they think the price is prohibitive. White Water offers a wide range of quality products and services. Having customized water for your business or personalized water for special events is an excellent way to stand out! Pricing is determined based on order quantity and frequency. Premium Purified Water with your own customized label. Let us create your custom label, or provide us with your own design. If you live in valley that encompasses all of Phoenix and it’s outlying cities such as Chandler, Mesa, Tempe, Gilbert, Glendale, Scottsdale, Surprise and Cave Creek, you can get fresh pure bottled water delivered direct to your door. 3 or 5 gallon water bottles are delivered direct and we provide the water coolers too! We can arrange water delivery in Arizona for most towns and cities. We offer free delivery to customers in the Phoenix metro area. If you live outside of the Phoenix area, please call us directly at (602) 462-5300. We purify the water for you, providing delicious tasting water that encourages people to drink the healthiest liquid for hydration available. White Water service and commitment is second to none! Courteous service and on-time delivery. Reverse Osmosis (RO) is the finest form of water filtration available. The film in the filter membranes is so thin it allows the removal of contaminated particles as small as individual ions. We can see then that water filtration is something that can still add health benefits even to municipal water supplies. There are many filters on the market but none with the performance of an RO system. Call us at (602) 462-5300 or fill in the form at the bottom to find out about having an RO system installed in your home today! Ready to Have a Reverse Osmosis Water Filter installed in your home today? Click below for more info. Let us co-pack for you! In addition to various sizes of single-serve bottles, we can also fill and label 1-Gallon and 2.5-Gallon bottles. Find out more information about the water you drink. We want to keep you and your family healthy.